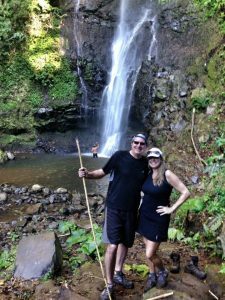 In 2013, Greg and Jen Seymour left the corporate world where work more, make more, spend more, was the mantra and moved to Costa Rica. They became experts on the country and each wrote Amazon best selling books on the subject of chucking it all and moving to Costa Rica. You can find Jen’s Amazon Author Page here and Greg’s Amazon Author Page here. Jen also has a successful jewelry business, which she started in Costa Rica. 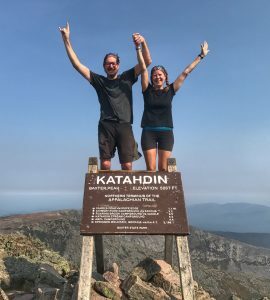 After 4 years of enjoying Costa Rica and a new fondness for hiking in the mountains of the Central Valley where they lived, the couple decided to repatriate to the U.S. What better way to transition than to spend 6 months thru-hiking the Appalachian Trail? Starting on Springer Mountain, Georgia on March 22, 2017 and ending on Mount Katahdin, Maine on September 16, 2017 the thru-hike was THE adventure of a lifetime. Along the way they documented their journey daily on their YouTube channel Appalachian Trail Tales and became known by their trail names Chica and Sunsets. They also write about their experiences here on AppalachianTrailTales.Com. What’s next? Stay tuned as the couple take on the Camino de Santiago, a 500-mile pilgrimage walk in Spain, in September, 2018. They will continue to blog here and video on YouTube, you can also find them on Instagram. The couple’s philosophy is to work to live, not the other way around, and they continue chasing adventure not the dollar.